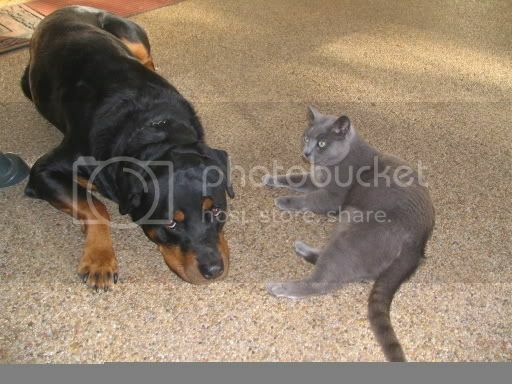 This is my dog Max, a Rotweiler and my cat Jasmine. Jasmine loves Max.. she loves to play with him and chase him around the yard when I'm walking him. I always have to make sure I'm paying attention to where she is or she'll sneak up on us and go charging in front of him to make him chase her.. If I'm not careful, I 'll be taken for a flying leap when Max goes after her..